I am interested in studying social, group and political behaviour. I apply techniques from mathematical modelling and data science to these topics. My work detects clusters of people on Twitter, revealing groups who share a sense of identity. I characterise those groups according to their language use and can track their growth and spread in the network. I have developed methods to target particular groups of interest on Twitter and then sample members of those groups. This can have great value for mapping social/political groups, understanding their dynamics, and tracking their evolution. 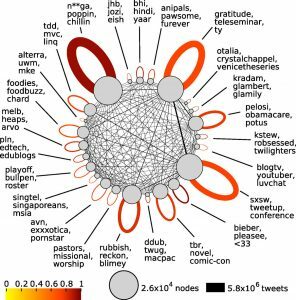 The method for grouping Twitter accounts and classifying the groups using their language was shown in an academic paper. The work was covered by The Guardian and The Daily Mail. The sample shown was a broad sample of the complete Twitter web site, it is now possible to target the sampler to more specific groups. Network of groups found on Twitter. Each group has words which they use unusually commonly. These words identify the group and some are shown. The links are sized according to the number of @mentions between the linked groups. I have developed a model of how people cluster together on social networks. We called this the social butterfly effect because people move between groups in our model. One of the important messages of the work is that clusters or ‘cliques’ are formed when people tend to bias their interactions to others with similar interests to their own. I come from an academic background working in Computer Science and Mathematical Biology fields. I’ve studied social behaviour in a broad range of animals from slime mould, bees and aphids to online human behaviour on Twitter. This included studying how bee colonies are affected by stress from pesticides and other diseases. We showed how colonies subject to stress from pesticides can often be on a knife edge between growth and collapse. A list of my academic publications can be found on Google Scholar. Just send an email to contact @ this domain name.